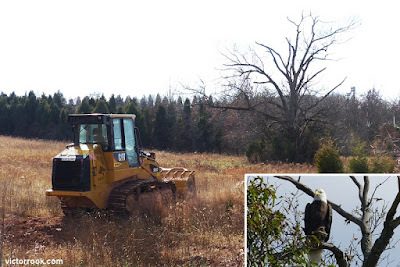 It was something most of us only found out about this summer while we witnessed the eagles' nesting grounds decimated by builders of two large warehouses: the City of Manassas, Virginia, also had plans to tear up the 40 acres of land surrounding the feeding pond down the street. This is where the bald eagles regularly fish for themselves and their young. It is also home to herons, geese, ducks, hawks, ospreys, and a large variety of plant, animal, and insect life. It will be replaced by office buildings, retail shops, residential units and, unless they pull out of the deal and find a better spot that won't upset their current patrons, Heritage Brewing. One of the main perching trees for the bald eagles has been removed. It had been in the plans for decades to develop the strip of land that leads from the City's core to the Manassas airport. According to Councilman Ian Lovejoy, who voted against the development along with Councilman Marc Aveni, there is a competition between surrounding Prince William County and the City to be the most "economically developed." A developer by the name of Lerner Enterprises backed out of the deal years ago because of the recession. Buchanan Partners LLC stepped in in 2015 and struck a deal with the City. On Dec. 13, 2016, the City held a groundbreaking ceremony, and now much of the damage has been done. Both sides of Gateway Blvd. have been plowed down. One of the eagles' favorite perching trees has been removed, and grading on one side of Gateway Blvd. has already begun. This is where over 270 high-density, high-priced residential units will be built. On the opposite side, mere feet from the pond, is where the rest of the development will take place. A permit for Discharges of Stormwater from the Virginia Department of Environmental Quality (VDEQ) is posted at the site location, however, we are unaware and do not believe the City or the developer hired a biologist to determine the effect the development will have on the wildlife. Development will clear up to the pond's edge. 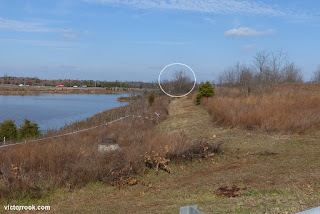 The Cannon Branch pond, though man made, has been erroneously referred to as a "retention" pond, which gives the impression that it does not flow elsewhere. On the contrary, the pond flows under the street into a smaller pond, then over a retaining wall, and turns into the Cannon Branch River. There is even an inlet to the pond next to the cemetery by the DMV. The pond is also loaded with fish, which isn't something that just happens when you dig a big hole. In fact, the Cannon Branch pond has transformed into an entire ecosystem over the years. Insects feed on the bountiful plant life. Fish eat the insects and insect larvae. 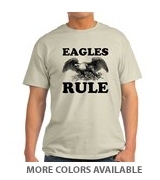 And the eagles feed and rely upon the fish. Now that most of that plant life is gone, there will be little for insects to pollinate. Without insects you have no fish. And with no fish, no bald eagles. The entire ecosystem begins to collapse. 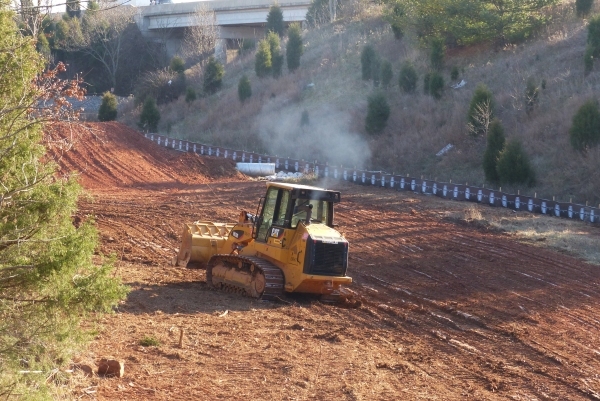 Tree removal and grading of land for residential units. A number of citizens have expressed their dissatisfaction with the excessive development within the city. They do not see this as "progress." They see more traffic, more congestion, and with more homes comes more children. And more children means overcrowded schools. With so many vacant office buildings, retail stores, and residential units within the city already, you have to wonder what kind of mentality would make these kinds of decisions. Greed. As some have put it, grass doesn't pay taxes. Even if the development fails, the City will still get their money--upwards of $20 million in land sale proceeds and $3 million in taxes. To help protect these eagles and others around the country facing similar circumstances, please go to baldeaglefilm.com and donate to the important documentary, "Who's Protecting Our National Bird?"